As a performer, I enjoy working with my clients to customize my services to best meet their needs. My repertoire includes a wide selection of classical, popular, and folk music, and I am happy to accept special requests. I can help you select music to personalize your event to reflect your unique style, and I have many examples of programs to provide ideas and inspiration. I provide a personal consultation with all wedding performances, and consultations can also be arranged for other performances. For more information about Stephanie's services for weddings and events, see her Frequently Asked Questions page. As a harp teacher, it is my goal to encourage, support, and develop my students' musical talents and interests. I believe this is best accomplished through individual attention, and I tailor my program to match each student's background and needs. My curriculum includes private harp lessons as well as opportunities to participate in a variety of events, including regular harp recitals, our annual holiday concert, theory classes, master classes, guest harpist performances, and harp ensembles. I can help students prepare for the MTAC Certificate of Merit® examination and for the UK-based ABRSM (Associated Board of the Royal Schools of Music) exams, which are internationally recognized and taken by more than 600,000 students in 93 countries every year. I have found great joy in the harp, and I look forward to the opportunity to share the delights of this beautiful instrument with you. Please contact Stephanie at (408) 366-8810, or at . Stephanie is an experienced professional harpist who teaches and performs regularly at weddings, receptions, dinners, and other engagements. She has played throughout the San Francisco Bay area since 1996, and has been teaching since 1998, the year in which she co-founded Harpeggio Music. She is the resident harpist of the San Jose Wind Symphony, and played the harp regularly for Sunday brunch at the Crowne Plaza in Milpitas from 2000 - 2001 and at the San Jose Hilton Sunday brunch from 1996 - 1999. In addition to the harp, Stephanie has played the piano and french horn for over 40 years. 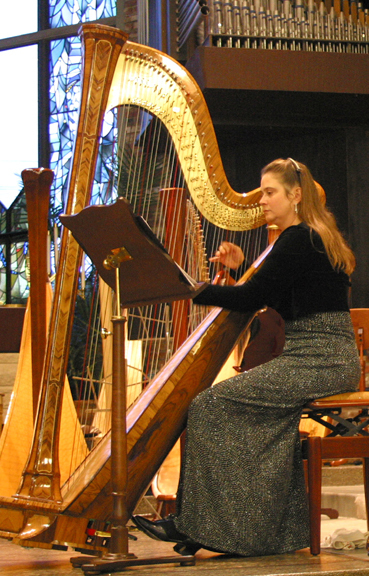 Stephanie began her harp studies with Phyllis Schlomovitz, formerly principal harpist of the Milwaukee Symphony Orchestra, and continued them with world-renowned harpist Paul Hurst, who has been guest artist at prestigious events such as the World Harp Congress in Prague, the International Harp Festival in Soka, Japan, and the American Harp Society National Conference in San Francisco. Stephanie also studied in England with David Watkins, former principal harpist of the London Philharmonic Orchestra. She has participated in seminars and master classes with leading harpists such as Jana Bouskova, Susann McDonald, Josef Molnar, Aristid von Wurtzler, and Park Stickney. Stephanie has extended her knowledge of music theory and history through college-level study. 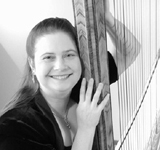 Stephanie is a member of the Music Teachers' Association of California (MTAC), the American Harp Society, the American String Teachers Association, and the International Society of Folk Harpers and Craftsmen. Stephanie's non-musical background includes an M.S. and PhD in Operations Research from Stanford University, and a B.A. in Computer Science and Applied Mathematics from the University of California, San Diego. She was a software engineer for 18 years, 14 of which were spent at Hewlett-Packard. After many years in the high-tech industry, Stephanie decided to pursue her real love – the harp.